Sunglasses are great at protecting against glare while driving, which means better visibility, keeping you and everyone else safe on the road. Extreme brightness and distracting reflections can impair visibility when driving and be the cause of a freak accident. If you have the window down or you're riding, dry winds and dust are additional distractions to deal with. Sunglasses, as simple and ubiquitous as they are, can offer protection from these elements. Choose sunglasses with lenses that are impact-resistant and made of polycarbonate. Don't be penny wise, pound foolish. Ensure your sunglasses block 99-100% of UV-A and UV-B rays. Look for sunglasses labelled 'UV 40' for best protection. Go for grey lenses, as they reduce the intensity of light without heavily altering the colour of objects. Even though many contact lenses have some degree of UV protection, it is still important to wear sunglasses when driving. Ensure the sunglasses fit properly and shield your eyes from all angles. Polarised or mirrored lenses offer the best protection against the bright sun (and harmful ultraviolet rays). The right model can also protect from dust and even strong winds. A wind barrier will also reduce the rate of evaporation of moisture from your eyes and keep your eyes comfortable and healthy. So, what must you consider when buying sunglasses? Which one is right and which should you avoid? Doctor Navin Sakhuja, eye surgeon at Moolchand Hospital, New Delhi, gives you expert advice. Q. Is it necessary to wear sunglasses while driving? A. It is important to wear sunglasses on a bright day. Not only do glasses protect against glare, they also prevent bright reflections from distracting and interfering with your sight. On a bright day, the amount of light reaching the retina is very high and the retina cannot close enough to reduce the amount of light entering the eye. This causes you to squint constantly, which can also cause headaches and nausea. Sunglasses serve to limit the light that reaches your eyes and can eliminate the need for squinting. Q. What should one keep in mind when buying sunglasses? A. UV, or ultraviolet, protection should be the top priority. No matter what the colour of the lens, the most important factor is to make sure your sunglasses block 99-100% of both UV-A and UV-B rays. Buyers should look for sunglasses labelled 'UV 40'. You should also choose lenses that are polarised. They reduce glare from reflective surfaces like glass or polished metal. Q. What colour lenses are suitable for sunglasses for drivers? A. Tints are applied to lenses to help absorb light as it passes through. It is best to consider amber, neutral grey, brown or green colour lenses. Grey lenses reduces brightness, but does not distort colour. Blue glasses are not suitable for driving, while yellow sunglass lenses are really good for sharpening up images, but causes more colour distortion. Brown lenses reduce glare sufficiently well, including absorbing the blue frequency of light in the sun's rays, which makes your surroundings seem hazy. Q. How good are anti-glare sunglasses? A. They are better because they protect you from sunlight reflecting off surfaces of tinted lenses, cars with a shiny metallic body, mirrors and so on, when the sun is behind you. Anti-glare helps you when driving at night as well. Q. Does it really matter if the glasses are made of plastic or glass? A. No, (but) plastic lenses are lighter and more stable than glass lenses. Q. What happens if you wear the wrong type of sunglasses for long? A. It can cause serious problems, such as retinal damage, degeneration of the macula or even cataract. Cataracts and macular degeneration can be caused by (overexposure) to ultraviolet light as well as through the use of the wrong type of sunglasses. It can also cause cancer of the eyelids and skin around the eyes. 1) Aviators; while the cool, dark lenses are suitable for driving, the thin metal bracket does not protect against irradiation and reflection from the sides. 2) The use of glasses with big frames, such as these ones with brown lenses, do reduce some glare, but is not the best choice available. 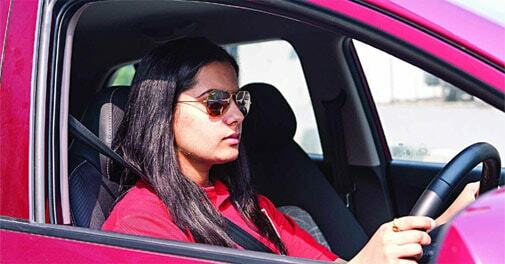 3) These fashionable pair of glasses for ladies is good to make a style statement, but is rather intrusive while driving. 4) Sufficiently big and broad on the sides, these types are best for motorists. 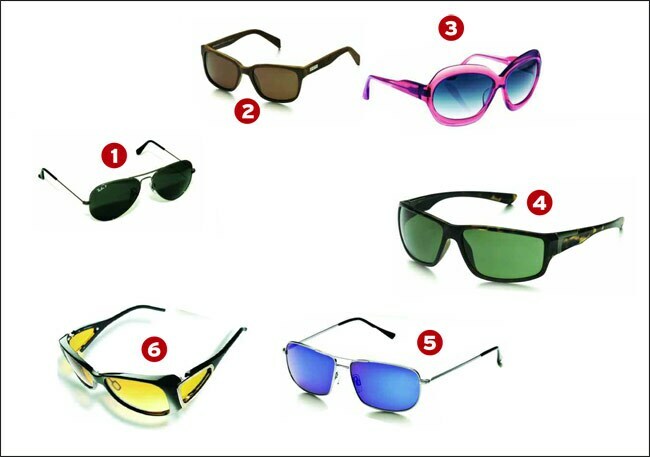 5) A good glass with blue lenses is suitable for sun protection, but not for driving as it can distort the surroundings. 6) Yellow tints will make it look even brighter than it actually is.